Princeton University in New Jersey has revealed details of its e-textbook programme using Amazon's new 9.7-inch Kindle DX reader. 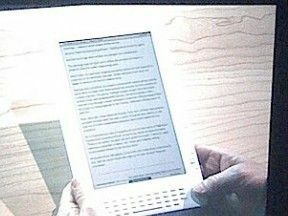 Under the pilot, the reading materials for three courses due to start in the autumn will be loaded on Kindle DX devices. Participating students and faculty members in the selected courses will receive a free DX that they will be allowed to keep. The $30,000 (£20,000) cost of the project is being met by a sustainability fund, and its aim is to reduce the number of pages printed throughout the University. Internal statistics show that students are not reading digital articles and book selections on their computer screens, but rather downloading and printing the same files again and again, in the course of a semester. Last year, Princeton printed 50 million sheets of paper at the cost of $5 million (£3.3 million) and 25,000 trees. If e-readers can cut down that printing by 1 per cent, Princeton will have more than made up for what was spent on this pilot. At the end of the pilot project, Princeton will assess what effects the readers have had on reducing printing and on teaching and learning in the selected courses. The results will be made public. Princeton is one of six American colleges and universities participating in the project, joining Arizona State University, Case Western Reserve University, Reed College and Darden School of Business at the University of Virginia.